Synopsis: In a squalid ancient city on the edge of a desert (based in part on the African Sahara’s Empty Quarter) a weary, thrill-seeking thief named Omari sets his home afire to start anew and to cover his many crimes. When the entire city is unintentionally destroyed by the flames, the cornered thief tells the displaced people a lie about a better place which only he can lead them to, across the desert. With the help of an aged, mysterious woman who knows a better place actually does exist, they set out. The desperate people must come together to fight their way through bandits, storms, epidemics, and more. As a result of Omari’s involvement with Saba, a fiercely independent woman who is out to break him in the pay of a merchant whom he has offended, his ability to lead is jeopardized. I received a free copy of Omari and the People from the publisher, in association with The Audiobookworm, in exchange for a honest review. This did not, in anyway, influence my opinion. Omari and the People was a huge leap outside of my comfort area. It’s the first audiobook I’ve ever finished–I attempted to listen to The Red Necklace a few years ago because it was wonderfully narrated by Tom Hiddleston, but even he couldn’t hold my attention for the entire duration. This is also an adult fiction novel, which I rarely read. I was more than hesitant to sign up for this blog tour, but I thought it was about time to expand my horizons. This novel did not disappoint though and it was a great introduction to both worlds. 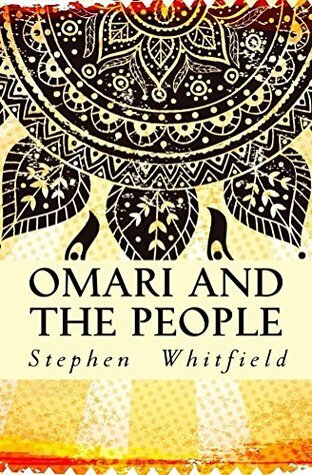 Omari and the People is a beautifully written adventure of Omari, a thief and self-proclaimed loner, and his journey not only leading a caravan of newly disenfranchised people across the dangerous, dry desert, but a journey to find himself and his purpose along the way. As the caravan makes its way across the desert seeking a rumored but never seen oasis, they have to overcome numerous obstacles from hunger and dehydration, heat, and sandstorms to war with an opposing caravan and betrayal by those unhappy within their own camp. The narration brings this beautiful imagery and assortment of larger-than-life characters to life in a way I’ve never experienced. Curt Simmons’ steady and distinctive accent throughout the performance, coupled with Stephen Whitfield’s vivid descriptions, created mental characters and images that were as real as looking at a picture. The narration immerses you into the story and the daunting 11-hour run-time is almost over before you know it! Omari and the People is a great read for fans of magical realism and fantasy. This is an adult Aladdin with more betrayal and higher stakes. Chicago-born Stephen Whitfield began writing as a Marine Corps print journalist. His writing has appeared in military publications, as well as the Kansas City Star and the Jersey Journal. He holds degrees from from Loyola University Chicago, Chicago Theological Seminary, and Indiana University. His various adventures have taken him to such places as London, Paris, Trondheim, Johannesburg, Beirut, most of The Virgin Islands and the wilder neighborhoods of Chicago. Click here to check out other stops along the tour!